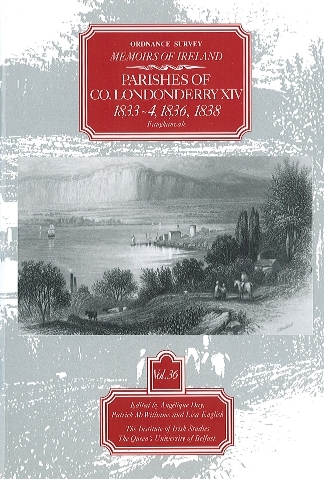 Ordnance Survey Memoirs of Ireland, Vol 36: County Londonderry XIV. The Ordnance Survey Memoirs are a uniquely detailed source for the history of the northern half of Ireland immediately before the Great Famine. They were written in the 1830s to accompany the 6” Ordnance Survey maps, but with one exception were not published at the time. In this new edition they act as a nineteenth-century Domesday book and are essential to the understanding of the cultural heritage of our communities. The Memoirs document the landscape and situation, buildings and antiquities, land-holdings and population, employment and livelihood of the parishes. This volume contains the Memoir for the parish of Faughanvale, extending eastwards from the south of the Faughan along the southern reaches of Lough Foyle and covering the villages of Muff (Eglinton) and Faughanvale. Also included are some miscellaneous papers relating mainly to this part of county Londonderry. We learn of the early history of this coastal parish, which was home to a number of gentlemen’s seats, including Willsborough, and was equally well endowed with mills and public buildings, not to the detriment of numerous remains of antiquity. Social life is particularly well delineated, with extensive details on agriculture and occupations, while records of the management of schools and the dispensary suggest a desire for improvement amongst the people. Together this material paints a fascinating portrait of this area over one hundred and fifty years ago. Illustration: ‘View of Lough Foyle’, c. 1840, by H. Gastineau, from Ireland, its scenery and character, vol. III (London, 1846) by Mr and Mrs S. C. Hall.